My perspective has been askew recently, I think. The airplane dips its wing to the right in a slow descent arc above Genoa, Italy. I lean forward and gaze through a tiny oblong window. Below a thick white outline divides where waves and shore meet. A sail bobs. A ship glides like silk. Red tile roofs and yellowed stucco houses crowd as if one glued mass of humanity. Does God involve Himself with every life? An olive skinned Sicilian sits a row in front of me, across the aisle. His dark head is bent over a rosary in his left hand. Its cross dangles over the arm rest and sways at 2,000 feet in the air. Stubby fingers caress tiny round beads like a lifeline, his lips move silently over each. He feels my eyes, and glances back at me. In silent communication he lifts the beads with one hand and, places his other hand on his heart. The Psalmist pens, “The Lord looks down from heaven; he sees all the children of man from where he sits enthroned he looks out on all the inhabitants of the earth…” (Ps. 33:14-15; ESV). Sometimes I chafe under why God does what He does in the way He does. I’m shortsighted, myopic in vision. I don’t know why He allows things to happen or not happen, and I thrash about like a child within the constraints of a Father’s arms. His sight encompasses time from its beginning to end, every nation, and each eternal soul. He sees through the my skin and into my heart. But, my view unravels between what I see with my eyes and what I can’t. If God is Supreme Ruler and King, then spiritual growth is in part learning to embrace and rest in the fact that God is God, even if life’s happenings don’t fit into my expectations of Him. “…he who fashions the hearts of them all and observes all their deeds.” (Ps. 33:15; ESV). The airplane lands its shuddering weight, the touchdown is rocky, the force pushes me against the seat. I can’t tell if it is an expletive or a prayer. But, we are on solid ground, and he looks at me again and smiles. Sheepish almost, he lifts the rosary and points to heaven. I smile, nod and point upward in return. 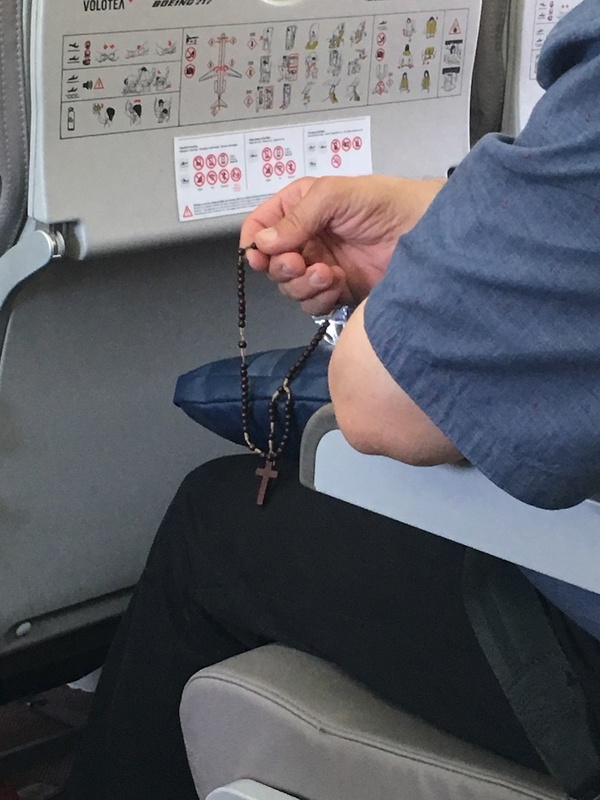 I don’t know if the rosary was a good luck charm he’d pulled out to assuage the fear of the moment or something deeper, but the incident reminds me that God sees all. He knows every heart around the globe. He cannot be placed inside the box of my understanding nor twisted to conform to how I want Him to be. I question the perspective my faith represents to others. Do I reflect man-birthed replications or Jesus-driven truth? “…that they should seek God, and perhaps feel their way toward him and find him. Yet he is actually not far from each one of us…” (Acts 17:27; ESV). Where my perspective wants, His is complete. I wish I could have started a conversation, asked faith questions, or shared Scripture. It didn’t happen, and the brief interchange of our lives ended. Yet, the view from on high often replays in my mind. It challenges me to examine my perspective. It motivates me to pray for an unnamed Sicilian who was afraid to fly. Perhaps these prayers may be a fragile cog in the life of a stranger loved by a Sovereign God. In His panorama people become souls. Love this… Where my perspective wants, His is complete… and so true ! We just talked about God’s incomprehensible knowing this am at Bible study! I love how you framed this Sylvia! Great job! Thanks for the encouragement Jill.